U.S. President Donald Trump addresses the 72nd United Nations General Assembly at U.N. headquarters in New York, U.S., September 19, 2017. NEW YORK - Chalk one up for the nationalists. Among the many signals that Donald Trump sent in his speech to the United Nations on Tuesday, one was especially clear: former chief strategist Steve Bannon’s White House departure has not muted the president’s “America First” foreign policy instincts. Trump’s eight months in office have been characterized by a sometimes dramatic tug-of-war between “globalists” and “nationalist” advisers who have sought to move the president in myriad ways on issues both domestic and international. Bannon’s exit last month caused some of the former New York businessman’s core supporters to fret that the more multilateral-leaning group inside the administration had gained ground. Not on foreign policy, at least not on Tuesday. 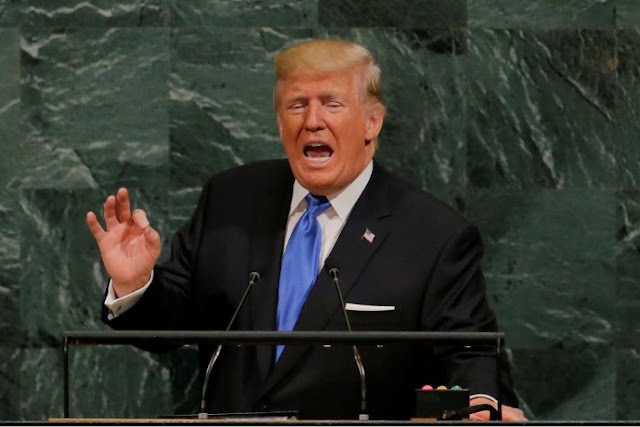 Trump’s strident defense of national sovereignty during his debut at the annual U.N. General Assembly showed his campaign-honed policy inclinations very much intact and presented a Trump Doctrine to the world that focused unabashedly on the U.S. homeland. ”The chief nationalist in this administration is Donald J. Trump. And he knows what he’s trying to say,” said Newt Gingrich, the former speaker of the U.S. House of Representatives and a Trump supporter. He said the speech showed that Trump had a doctrine that was defined by more than tweets, with roots in the conservative philosophies of former U.S. President Ronald Reagan, France’s Charles de Gaulle, and Britain’s Margaret Thatcher. “It’s not a one-sided American nationalism, it’s a re-centering on sovereignty that’s really, really important,” Gingrich said. The speech, in which Trump threatened to “totally destroy” North Korea if attacked, divided Trump’s supporters and opponents. Ben Rhodes, an adviser to former Democratic President Barack Obama, said Trump was upending international order with threats of war and attacks on diplomacy. It did not divide Trump’s often warring advisers, however, an administration official said. “It was the most collaborative speech among the senior people in the national security cabinet that the president has given to date,” the official said. He said Secretary of State Rex Tillerson stood up after Trump’s speech and shook chief speechwriter Stephen Miller’s hand and said “you did a great job.” Miller is considered a nationalist and an ally of Bannon, while Tillerson is more globally minded. ”This was more ... Trump just being Trump,” said Sam Nunberg, a former Trump campaign adviser, adding he thought the nationalist versus globalist tension in the administration played itself out more on domestic policy issues such as immigration policy. The administration has given mixed signals on foreign policy, too. Gary Cohn, the president’s top economic adviser and a member of the so-called globalist wing, had to clarify with U.S. allies this week that Trump still intended to pull the United States out of the Paris climate change agreement unless there were a renegotiation to make it more favorable for U.S. interests. But Trump seemed to stun some people in the United Nations hall, despite his well-known penchant for blunt talk. His speech included a condemnation of the Iran nuclear agreement reached with U.S. allies under Obama, and an observation that some portions of the world were “going to hell”. Aaron David Miller, a former Middle East negotiator for Democratic and Republican administrations, said allies would interpret the speech as a sign that Trump was wary of undertaking major commitments around the world. “Neither of the biggest problems, North Korea and Iran, can be solved by an America First, Lone Ranger policy,” he said, adding the speech showed that globalists within his administrations were “throwaways” and that Trump was still driven by nationalism.